Have you ever dreamed of purchasing your desired Android device from Jumia at affordable and low price, then Jumoa Mobile Week is coming and getting closer to grant your wants. Starting from May 31st 2016, Jumia Mobile week would commence at it would be hotter than ever. Purchase Innjoo, Infinix, Tecno, Lenivi and Samsung Mobile devices at low and affordable prices. We at Jumia Nigeria know that mobile phones have rapidly become an important part of our everyday lives. Either by staying in touch with loved ones via social media or replying business e-mails on the go, we definitely need our mobile phones at all times. At Jumia, we put the needs of the people first, that is why we present to you the reloaded version of Jumia Mobile week with exclusive mobile phone launches and daily flash sales from your favourite brands. From 31st May-6th of June, 2016. Our precious customers will be able to purchase different brands of mobile phones at incredible and jaw-dropping prices! This is guaranteed to be much bigger than the record breaking 2015 Jumia Mobile Week Megathon! Do not be left out! Jumia offers the best prices online for the world's hottest phone brands ranging from Innjoo, Infinix, Tecno, LG, Samsung, Lenovo, Apple and so much more. Enjoy unbelievable mobile phone deals during the Mobile Week Reloaded 2016. This year's Mobile Week Reloaded is definitely going to break the internet, even bigger than Jumia black Friday! Do not be left behind on this wonderful week long mobile phone price slash. Now is the right time to buy that sleek mobile phone you have been craving for. Wow your loved ones with mobile phone gifts during this amazing week of incredible price slashes and flash sales on your favourite phone brands. 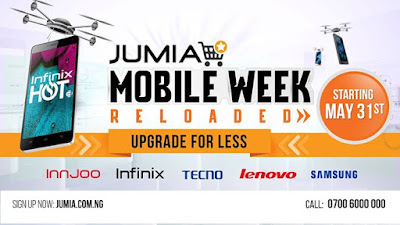 Enjoy 48 hours delivery in Lagos during the Jumia Mobile Week Reloaded. Take advantage of our pay on delivery or online payment options and order for your favourite brand of mobile phone.